surveyed 245 senior marketers across Asia Pacific. Marketers from ANZ, BMW, Cathay Pacific Airways and Virgin Mobile participated. Here's an infographic of the findings. Click it to download the full graphic. Marketers' efforts to make companies in Asia Pacific, including Australia, more customer-centric are being held back by operational gaps, laggard systems and minimal resources, according to a new report by the CMO Council. It found companies in the Asia Pacific region are less customer centric than the global average and says marketers in the region, including those in Australia, feel they need to step up their game to live up to marketing claims. Most believe the company will be hurt if they don't put in place a “champion for customer experience to front the rise of “always-on, brand conscious consumers”. Seventy five per cent of marketers surveyed said back office systems and operational structures hold them back from living up to brand promises and marketing claims. They point to more real-time insight and actionable data analytics being needed to create a more customer-centric organisation. NAB restructured its teams and shifted the customer experience team into the product and marketing department to close the disconnect between the customer and sales focused areas of the business. Marketing owns the entire customer journey and the bank has seen an uplift in customer satisfaction, according to Chris Ho NAB head of digital content, who was interviewed as part of the report. Just 9% of marketers said there was strong alignment between operational functions and a seamless customer experience across different touchpoints. 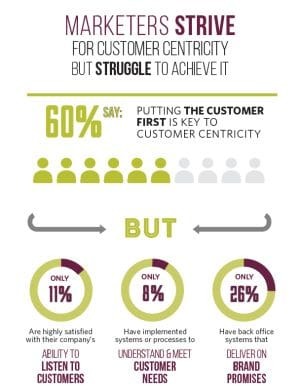 Only 21% of marketers have calculated how customer experience directly impacts business performance through lost or gained sales, defection or advocacy and only 36% have a formal customer experience management program in place. The report surveyed 245 senior marketers across Asia Pacific. Marketers from ANZ, BMW, Cathay Pacific Airways and Virgin Mobile participated.